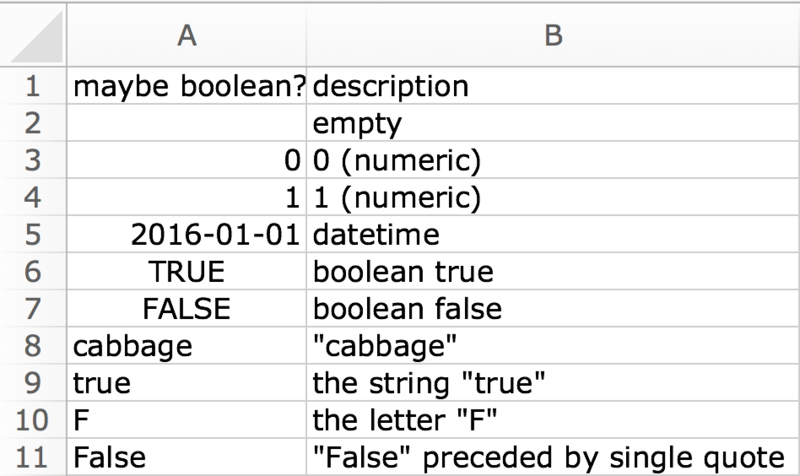 readxl::read_excel() will guess column types, by default, or you can provide them explicitly via the col_types argument. The col_types argument is more flexible than you might think; you can mix actual types in with "skip" and "guess" and a single type will be recycled to the necessary length. If you use other packages in the tidyverse, you are probably familiar with readr, which reads data from flat files. Like readxl, readr also provides column type guessing, but readr and readxl are very different under the hood. readr guesses column type based on the data. readxl guesses column type based on Excel cell types. with the wrinkle that datetimes are a very special flavor of numeric. A cell of any particular type can always be represented as one of any higher type and, possibly, as one of lower type. 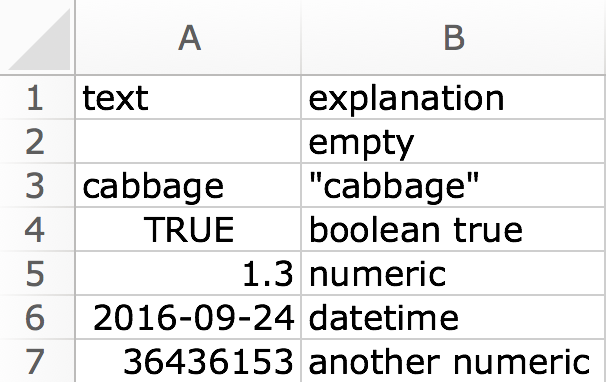 When guessing, read_excel() keeps a running “maximum” on the cell types it has seen in any given column. Once it has visited guess_max rows or run out of data, this is the guessed type for that column. There is a strong current towards “text”, the column type of last resort. Here’s an example of column guessing with deaths.xlsx which ships with readxl. If a column falls in your data rectangle, but you do not want an associated variable in the output, specify the column type "skip". Internally, these cells may be visited in order to learn their location, but they are not loaded and their data is never read. You cannot request that a column be included but filled with NAs. Such a column can arise naturally, if all the cells are empty, or you can skip a column (see previous point). This will create a list-column in the output, each component of which is a length one atomic vector. The type of these vectors is determined using the logic described above. This can be useful if data of truly disparate type is arranged in a column. We demonstrate the "list" column type using the clippy.xlsx sheet that ship with Excel. Its second column holds information about Clippy that would be really hard to store with just one type. Final note: all datetimes are imported as having the UTC timezone, because, mercifully, Excel has no notion of timezones. Contamination by embedded missing or bad data of incompatible type. Example: missing data entered as ?? in a numeric column. 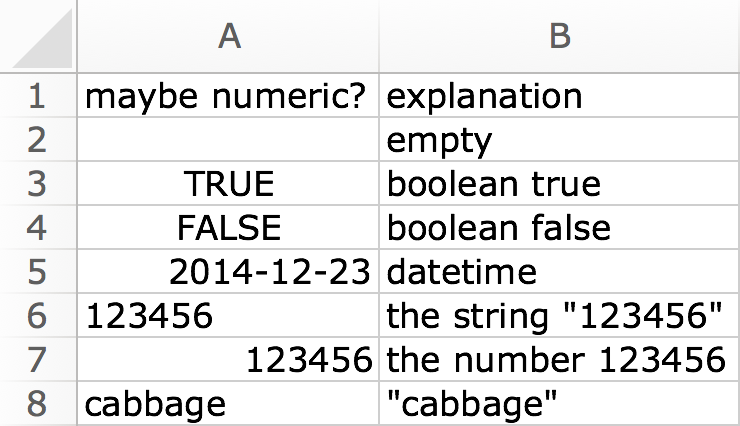 Fix: use the na argument of read_excel() to describe all possible forms for missing data. This should prevent such cells from influencing type guessing and cause them to import as NA of the appropriate type. Contamination of the data rectangle by leading or trailing non-data rows. Example: the sheet contains a few lines of explanatory prose before the data table begins. Fix: specify the target rectangle. Use skip and n_max to provide a minimum number of rows to skip and a maximum number of data rows to read, respectively. Or use the more powerful range argument to describe the cell rectangle in various ways. See the examples for read_excel() help or vignette("sheet-geometry") for more detail. #> 18 <NA>                   <NA>           <NA>   <NA>   <NA>     too! Non-data rows above and below the main data rectangle are causing all the columns to import as character. If your column typing problem can’t be solved by specifying na or the data rectangle, request the "list" column type and handle missing data and coercion after import. Sometimes you aren’t completely sure of column count or order, and yet you need to provide some information via col_types. For example, you might know that the column named “foofy” should be text, but you’re not sure where it appears. Or maybe you want to ensure that lots of empty cells at the top of “foofy” don’t cause it to be guessed as logical. Here’s an efficient trick to get the column names, so you can programmatically build the col_types vector you need for your main reading of the Excel file. Let’s imagine I want to force the columns whose names include “Petal” to be text, but leave everything else to be guessed. #>  "Sepal.Length" "Sepal.Width"  "Petal.Length" "Petal.Width"
#>  "guess" "guess" "text"  "text"  "guess"
You can force a column to have a specific type via col_types. So what happens to cells of another type? They will either be coerced to the requested type or to an NA of appropriate type. For each column type, below we present a screen shot of a sheet from the built-in example type-me.xlsx. We force the first column to have a specific type and the second column explains what is in the first. You’ll see how mismatches between cell type and column type are resolved. A numeric cell is coerced to FALSE if it is zero and TRUE otherwise. A date cell becomes NA. Just like in R, the strings “T”, “TRUE”, “True”, and “true” are regarded as TRUE and “F”, “FALSE”, “False”, “false” as FALSE. Other strings import as NA. #>  8 TRUE             "the string \"true\""
#>  9 FALSE            "the letter \"F\""
#> 10 FALSE            "\"False\" preceded by single quote"
A boolean cell is coerced to zero if FALSE and one if TRUE. A datetime comes in as the underlying serial date, which is the number of days, possibly fractional, since the date origin. For text, numeric conversion is attempted, to handle the “number as text” phenomenon. If unsuccessful, text cells import as NA. #> 5           123456 "the string \"123456\""
A numeric cell is interpreted as a serial date (I’m questioning whether this is wise, but https://github.com/tidyverse/readxl/issues/266). Boolean or text cells become NA. A boolean cell becomes either "TRUE" or "FALSE". A numeric cell is converted to character, much like as.character() in R. A date cell is handled like numeric, using the underlying serial value.